Shillong: It’s now official. Shillong is all set to play I-League hosts on January 18 on the newly-laid artificial turf at the Jawaharlal Nehru Stadium, when local giants Shillong Lajong take on the might Churchill Brothers from Goa. 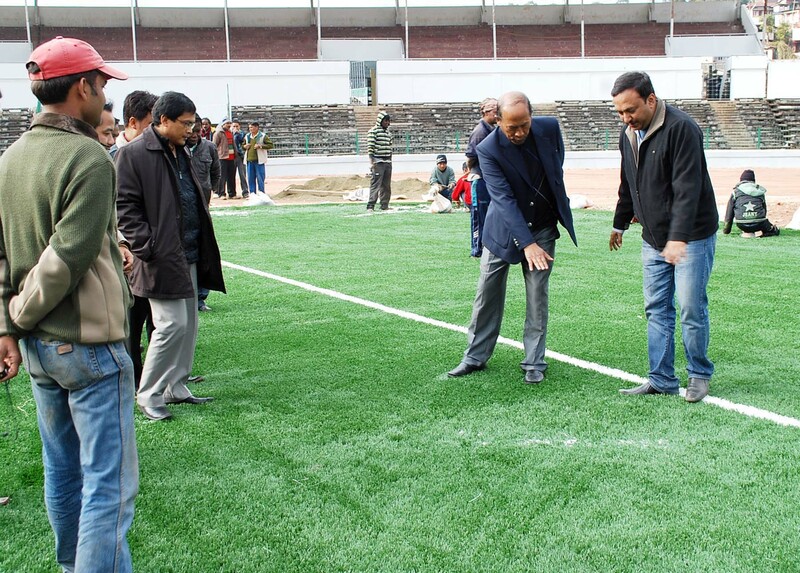 “The ground would be ready to hold the Shillong home match on January 18. The Hyderabad-based firm Decor India, a dealer of artificial turf of the US-based company Field Turf Tarkett, would be handing over the ground to the State Government on January 8,” Deputy Chief Minister Bindo M Lanong told reporters after inspecting the ongoing work for laying of the artificial turf at the Jawaharlal Nehru stadium on Thursday. Lanong said that the State Government would get ten days to prepare the ground for hosting its first I-League match of the season. When asked if any AIFF official would come for inspection of the ground before giving approval to host the match, the Deputy Chief Minister replied in the negative. “The AIFF is pretty much aware that the artificial turf is being laid at the stadium. I think they would be more than happy over the fact that Lajong’s home matches are being played in its own home ground,” Lanong said. When asked about the possibility that mud would spill onto the turf if it is not protected, he agreed that there were concerns about mud spilling onto the turf. “Definitely, the Government would take some measures to see that the turf is well protected. We would not want the money spent on this project to be wasted,” Lanong said. Meanwhile, Lanong informed that the State Government has already submitted its proposal to the Union Ministry of Sports and Youth Affairs for allocating the synthetic athletic track at the stadium. “We have proposed a total amount of Rs 7 crore to the Union Ministry for acquiring of the synthetic athletic track,” he said, while adding that once the synthetic athletic track is laid on the ground then the problem of mud spilling onto the turf would be solved. During the inspection, Lanong sought for extension of the artificial turf by another half metre so that players do not have any difficulty while taking corner kicks. It may be mentioned that the construction of the press box and the players’ dressing room are also going on in full swing. Meanwhile, the Deputy Chief Minister has also asked his officers to clean the whole surrounding of the stadium before the I-League match on Jan 18. It may be mentioned that laying of the Rs 5.13-crore artificial pitch at JN stadium had begun in July last year.